Welcome to JustRite Stampers' newest Wednesday feature, 12 weeks of Christmas Blog Hops 8! Every Wednesday up until Thanksgiving some of your favorite designers will be joining some of the JustRite design team for a series of Christmas blog hops, showcasing JustRite's entire Christmas Collection of Stamps! And don't forget that JustRite has some Christmas stamps in their newly released CLING line of stamp sets - you can find them here. This week, the designers joining the JustRite design team are the Flower Soft and The Shabby Tea Room challenge blog design teams! So mark your calendars for Wednesdays at 9am Central for great Christmas gift, card & project ideas, starting at the JustRite Inspiration blog! So, here's my creation, I decided to go with warm gold tones and rich red to reflect the wording in the sentiment. 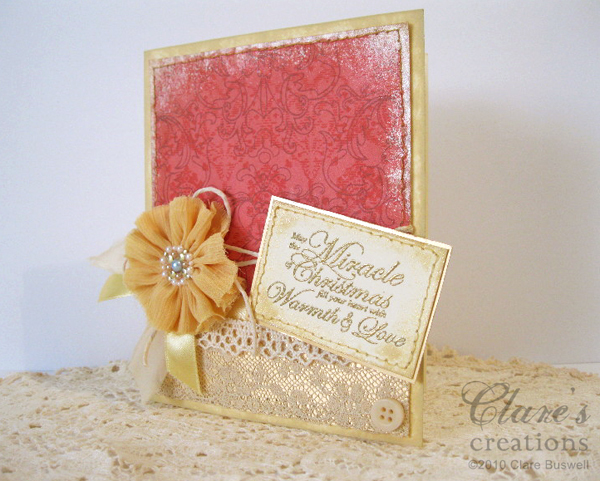 The sentiment I used is from the JustRite Christmas Collection - Christmas Nested Sentiments and Verse. 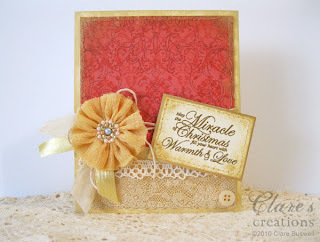 The wording in the sentiments are really special, I love using them! 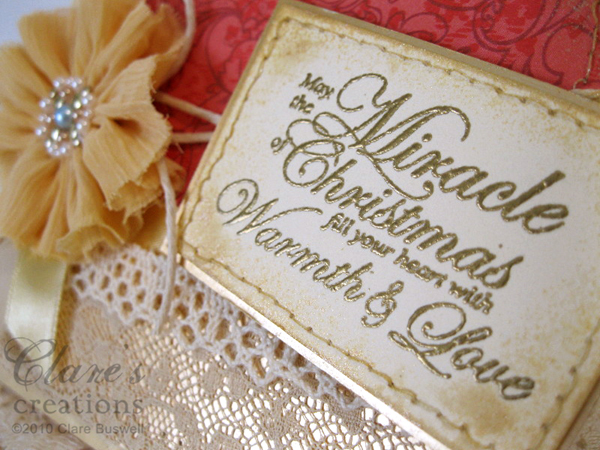 I stamped the sentiment using VersaMark and heat embossed using Mirror Gold embossing powder. I layered the sentiment onto some matt gold card ( I used the same gold card under the lace) and distressed the edges by sponging with Gold Creative Inspirations Paint. The pretty flower is a Prima, I added a little natural twine, yellow gold satin ribbon and some torn cream dress lining behind it. I love these flowers, the fabric is just beautiful. The pretty red paper came with the last issue of Crafts Beautiful Magazine. I sponged a little more of the Gold paint around the edges of the paper. Please visit these designers' blogs to see what fabulous JustRite Christmas inspiration they have for you on the hop today! 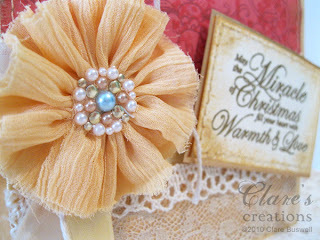 Card/Paper: Cream card, Matt gold card; Ink: VersaMark, Tim Holtz Distress Ink in Antique Linen; Stamps: JustRite Christmas Collection - Christmas Nested Sentiments and Verse; Other: Sewing machine, vintage lace, crochet lace, natural twine, yellow gold satin ribbon, cream dress lining, foam pads, Prima flower, button, Gold Creative Inspirations Paint, Mirror Gold embossing powder and heat gun. Hi Clare! Love your flower treatment paired with the sentiment! Perfect in every way! I absolutely love vintage and love this card. Great job - very beautiful. So glad you could join the hop. These hops are so inspirational. Love this card and sentiment, Clare! Clare, this is just stunning! I love it! Love this lace and fabric beauty! So very elegant and lovely! Love your beautiful eye for color and design! Pretty flower- love the center of the flower- so pretty! So sweet and dainty! Love the lace and bling. Do I make myself clear when I tell you that all I can do is looking at it, looking at it, looking at it over and over and over again? Beautiful card! Love the soft colors and the vintage look. Oh this is so soft and pretty Clare ... Just beautiful! Simply beautiful! I love the inked edges and the ribbon behind the flower! Just exquisite, Clare. Love the text as well as the beautiful handiwork on the card itself.